I wanted to do a post about sources for board short fabric as it can be hard to find if you don’t know where to look. First of all, the type of fabric you are probably looking for is polyester microfiber. This is the swim trunks fabric you’ll find in board shorts at the store. It is quick drying and soft to the touch, kind of like a brushed twill, except it doesn’t hold as much water for as long as twill. Polyester microfiber fabric comes in solids and prints My favorite sources for it are Rockywoods Fabrics, The Fabric Fairy and Seattle Fabrics. I’ve ordered from all 3 places, and I actually visited Seattle Fabrics in person last summer. So I just go to whichever place has the color(s) I want. Generally board short fabric is 58″ (150cm) wide; sometimes it is also treated with water repellant. The fabric description will give you the specifics. It’s also pretty affordable, averaging around $7/yard. Since swim trunks don’t take much fabric, you can make a couple pairs from one yard, making this one way to save money on clothing over store bought. If you don’t want to have to order your fabric, you can also look for nylon or nylon taffeta at your local chain fabric store. This can usually be found in the special occasion fabric section. BE SURE TO CHECK THE FABRIC CONTENT when shopping for taffeta – sometimes it is nylon, but a lot of times it is acetate. Acetate+water=VERY BAD, so make sure you’re getting nylon or a nylon/polyester blend of taffeta. The higher the nylon content, the faster the fabric will dry and the less water it will retain. You can also try ripstop nylon and PUL fabrics, but note that these can be really difficult to sew. Ripstop can fray really badly, and you may have to use a microsharp needle, and avoid seam ripping. French seams are usually a good idea with ripstop to keep it from coming apart at the seams. PUL fabric, on the other hand, is heavier and sometimes needs to be handled like vinyl or laminate fabric – using a roller foot, tissue paper and other tricks to keep it feeding through the presser foot. What about the mesh inserts in boys swim trunks? Truth be told, I mostly use mosquito netting to do mine; it’s available at the local chain store in the utility fabric section and it’s inexpensive. But Rockywoods and Seattle Fabrics also carry power net mesh, which is technically what linings are usually made of in boys swimsuits. For girls, nylon tricot is often used, and that is also available from those retailers, as well as local chain stores. And heck, you can totally use it for boys as well, because who’s going to see that except you and your kid? So hopefully that helps you when sourcing fabric for your Big Island Board Shorts or the newly released Salt Water Swim Trunks, show below. Thank you so much for this information!!! You go above and beyond just cool tutorials. See, because of posts like this I feel more comfortable going to the fabric store and knowing what to look for. For a halter top style sundress (yea 30 days of sundresses!) can you make any recommendations for sewn-in cups? I’ve never been able to wear halter top styles because I HAVE to have support/coverage. With so many of the sundress tutorials having a full facing for the top/front I thought about sewing cups into the lining or … making my own? Any recommendations for that? Thanks for the super info!!! I bought some polyester microfiber from an online fabric seller but really didn’t know what it was. I loved it when it came but didn’t know where to look for more. (I’m not sure my husband is thanking you, but he’ll get over it! LOL) Thanks, again and HAPPY INDEPENDENCE DAY!!! Thank you! 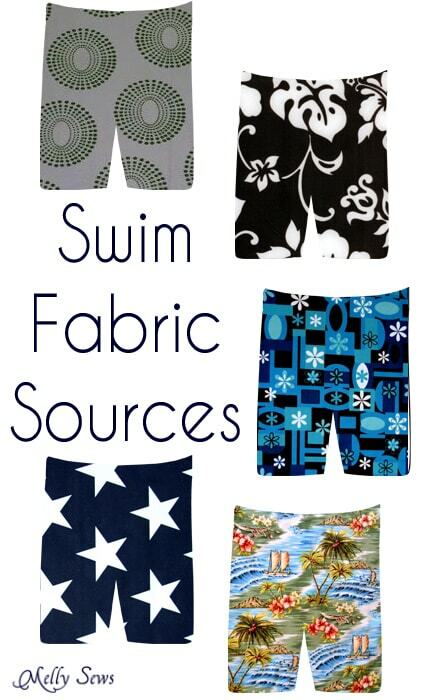 I always wondered where to get boys’ swim trunk fabric. Thank you for this post! I live by Seattle Fabrics and have never been, but now I know why I should! Thank you!!! We’ve wanted our girls to have some longer board shorts, but stores typically stock tiny tiny ones, and my girls weren’t thrilled with the “boy” trunks. I can make them girly ones now… Probably for NEXT year, but YAY!!! Thanks for the great info. I wondered where you were getting boardshort fabric at $7 per yard but then I noted the date of the article. Regardless of the date it was written – the information really helped ease my confusion this morning! I bought a pattern that called for swim boardshort fabric and could not decide whether all boardshort fabric was swim or not. You answered my question!!! Thanks, I’ve been trying to figure out what board shorts are made of.